A roadway construction zone is an area where construction, repair, or maintenance work is being conducted by public employees or private contractors on or adjacent to public highways. Under RCW 46.61.527, no person may drive a vehicle in a construction zone at a speed greater than that allowed by traffic control devices. Moreover, any person who drives a vehicle in a roadway construction zone in such a manner as to endanger or likely to endanger any persons or property is guilty of reckless endangerment of roadway workers. In Washington, violation of a statute is evidence of negligence and can be used to establish liability against the responsible driver. 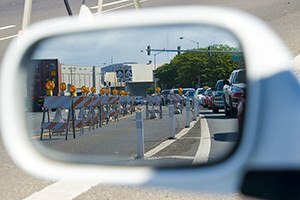 As lawyers representing DOT employees and contractors injured while doing work in construction zones, we know the hazards you face every day while doing the difficult work necessary to build and maintain our highways, interstates, and roads in Washington State. If you or a family member is seriously injured or killed in a road construction zone, contact one of our experienced road construction zone lawyers. We understand the rules that govern work in construction zones and have the resources necessary to obtain damages for injury victims. Contact our lawyers or call 206.624.8844 for a free consultation to discuss your rights and options.